The Energy Policy Act of 2005 (EPAct) was enacted creating immediate potential tax savings for building owners or architects and engineers based on the use of energy efficient improvements. 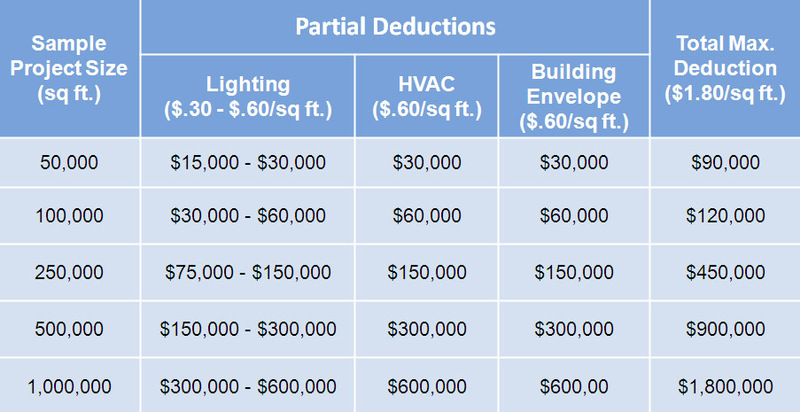 Section 179D outlines the requirements for a maximum potential tax deduction of up to $1.80 per square foot of affected spaces. At Energy Tax Savers, we know how to apply the tax law to make building energy equipment investments more profitable. As the first green tax firm, we help our clients achieve federal tax incentives aimed at making energy efficient investment as economically viable as possible. Energy Tax Savers will review your project on a Complimentary Basis. Projects between 1/1/06 - 12/31/17 are eligible. For new construction, we typical look for the Architectural, Mechanical, Electrical and Plumbing drawing sets in .pdf. For retrofits we look for information on the project, like project cost, spec sheets, energy saving estimates as well as the project address and any drawings (New or Pre-Existing). Upon completion of our complimentary review, we will estimate your project's tax deduction as well as provide you with a fixed fee quote for your project. We look forward to reviewing your project. We are happy to announce that as of this morning, EPAct 179D has been retroactively extended to include projects completed in 2017. Early this morning, Congress passed the "Bipartisan Budget Act of 2018" that included this retroactive 2017 extension of EPAct. This means that any commercial or government building completed in 2017 is now eligible for up to the tax incentive of up to $1.80/sq.ft. As soon as possible, we recommend beginning to compile information on any of your potentially eligible projects completed in 2017 so you can include the EPAct benefit on your 2017 tax returns. This would be available for any newly constructed or renovated commercial or government buildings completed in 2017. If you send us the data, we can perform our complimentary review and process in time for you to incorporate into your 2017 filing. Our Experts are constantly traveling for presentations and would gladly meet with you in your area.